I love the moodiness captured in this photo of Seattle. On one level there is the dark sky that implies a storm is about to let loose so get prepared and run for cover. Yet the bright sunshine on the buildings and the smoothness of the water in the foreground entice us to stay present and enjoy the moment, minimizing the implied threat from the background. Fascinating! This has inspired me to take a closer look at conflicting emotions and moods in faces then look deeper into what the same face ‘says’ about the individuals’ character. The ‘personality profiling’ aspect of the face reading classes I teach is complex yet absolutely fascinating and incredibly useful tools for helping us understand self and others better. I considered trying to distil the process down to short descriptions that I could feature in each of the monthly newsletters throughout 2015. However, experience has taught me that there is a tendency for some to then use the profiling tools as a shortcut to confirm the prejudices or misinformation of first impressions. The beauty of investing time and practice to learn all the ‘heart-centered’ face reading tools is that each of us can increase understanding and compassion while developing skills in knowing how to release our own full human potential while expanding our capacity to help others grow in positive ways as well. So come join in my classes and we’ll continue on this journey together!!!! All that said, let’s still take a look at moods in each face of the month and continue our practice of recognizing additional layers of emotions in the faces. Since the eyes are so expressive let’s focus our attention on that section of the face for the next few months. Here is an invitation to you – last year, a daily average of 14 people from 75 different countries across the world visited my website. I appreciate each of you and celebrate our mutual interest in face reading. If you would like to be featured as ‘Face of the Month’ anytime this year, please send me a photo of your face looking straight into the camera. If I use your photo on the website, I will then personally email you ‘reads’ I receive from students and followers of my newsletter as well as email you a more in-depth analysis from me. Are you up for this? I hope so … and I look forward to hearing from you!!! 1. What is a ‘mood’? 2. How do moods differ from emotions? Even ‘official’ definitions of ‘mood’ are conflicting. According to the Merriam-Webster dictionary, a mood is a conscious state of mind or emotion. Wikipedia defines mood as ‘an emotional state and adds that moods differ from emotions in that they are less specific, less intense, and less likely to be triggered by stimulus or event.’ Yolanda Williams, writing on education-portal.com, states that mood is a generalized, internal cognitive process or state of feeling. Wikipedia states that moods differ from emotions in that they are less specific, less intense and less likely to be triggered by a particular stimulus or event. Revisit the series of photos in the December 2014 face of the month. This is a vivid visual example of changing emotion and mood. Studying each of the three pictures, how do you feel his moods reflect both the transitory and deeply etched emotions? There can be no doubt that the experience of being in a war zone for a period of time has had a deep and lasting effect on this young man. In keeping with the theme of this month’s newsletter, study the changes in his eyes especially. In each photograph he is looking straight into the camera but notice that before being deployed to the warzone, Nicky’s eyes are open and both engage you. 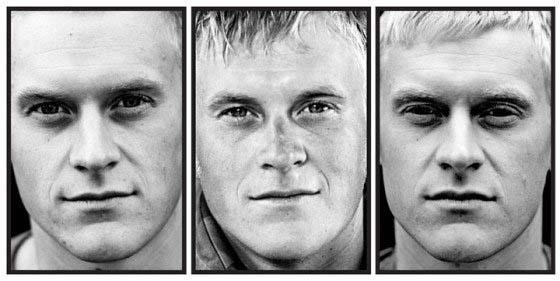 The middle photo, taken while he was serving in Afghanistan, also shows both his eyes open, the pupils bright yet not quite connecting with what he is looking at … there is a sense of disconnect. Significant change occurs in the third photograph, taken after he has returned to The Netherlands from the conflict. Both of his eyes are more closed and his right eye (his ‘social mask’ side) is totally disengaged in this encounter while so much grief and sadness is visible in his left eye (on the ‘private’ side of his face). What other changes do you observe in his face? “My series ‘Here are the young men’ (The Netherlands – Afghanistan, 2009-2010) show photos of Dutch marines deployed to Afghanistan. These marines are young boys, full of excitement and expectations who are being sent to a war zone. There they are confronted with pain, sadness and death. Will something appear on their faces of these experiences? To find an answer to this question Claire Felicie photographed the marines of the 13th infantry company of the Royal Netherlands Marine Corps, before, during and after their deployment in Uruzgan. Her series of photographs and her books are available to purchase on her website. To start the New Year I have chosen to focus on the area around the eyes for my ‘Face of the Month‘ challenge to new and experienced face readers. I welcome your comments, questions and views via email: glenna@glennatrout.com and will provide my interpretation next month. Please remember my invitation – if you would like to feature as ‘Face of the Month‘, please send me a photo of your face looking straight into the camera. Don’t be shy, give it a try !